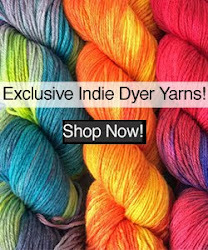 Today, we have a special guest post penned by one of our fabulous dyers from our Indie Dyers collection, Jacquline from Lattes & Llamas! Once upon a time, before my sister and cohort had a baby, our average day was smooth sailing. We’d sleep in until 9 AM, because what’s the point of owning your own business if you can’t stay up late knitting?! We’d enjoy a leisurely breakfast while we made of list of what needed to dyed. Then, I would set the yarn to soak and pull out the right dyes while Megan-Anne worked on Geek-A-Long stuff. Once the pots got going, our day would be divided into half hour spans: 30 minutes of watching Netflix and knitting or answering emails and then 30 minutes of setting up the next dye batch or rinsing out yarn. We were a well-oiled machine that sung along loudly to classic rock songs, and had no appreciation for just how much sleep and downtime we had. Natural Brown Lhasa Wilderness yarn prior to dyeing or washing. 1 AM: Megan-Anne finished a commission that is due later in the day. It still needs to block. At the same time, I’m working on website updates. If Mabel is sleeping, we’re working. By the time the commission is sitting in a bowl with some Allure wool wash, Mabel has woken up and demands her milky-tribute. 1:45 AM: I’m off to bed and Megan-Anne is pinning out her commission to block. By 2 AM everyone is sleeping. 6 AM: Megan-Anne’s husband gives Mabel her first breakfast. We use the opportunity to take showers and start pouring gallons of coffee down our gaping maws. Megan-Anne folding baby clothes and downing coffee while we argue about the best blues. 7-9 AM: Coffee. Talk about what needs to be done. Coffee. Design color charts or work on editing patterns. Coffee. Get in a heated argument about what’s more likely to over-dye effectively, Brilliant Blue or Royal Blue. Coffee. Also, some coffee. 9-11 AM: Megan-Anne nurses Mabel and my niece reluctantly goes down for a nap. This is it. The only part of the day she is guaranteed to sleep. We rush downstairs to handle all the tasks we don’t want her in the room for. She can’t be around when we mix colors. We have a brief argument over how to best cook the yarn, and ultimately decide we better do it both ways to see which one turns out better. At the same time, we throw together the colors for the skeins we need to dye for our next yarn show. Generally, we run about five pots at a time. One of our test colors ready to cook. 11 AM - Noon: Special Mabel time. She’s up and wants to play. Megan-Anne puts her in the baby Bjorn so that she can keep working. Watching her try to take a sweater off her blocking mat while Mabel is in the Bjorne is hilarious. I could sell tickets. 12-6 PM: I run pots while Megan-Anne teaches, works on commissions, or takes Mabel to one of the many appointments that newborns have. 6-8 PM: Dinner. We try to eat together as a family, and most nights we pull it off. We take the time to remind our husbands we exist or watch something from the rapidly filling DVR. Generally, at least one of us is still knitting during this time. 8 PM - Midnight: Mabel goes to bed at eight, and that means it’s back to work for us. We go look at the yarn that was done that day and decide if anything needs to be tweaked. We plan, design, and work on commissions. We make a list of people we have every intention of calling/emailing back tomorrow, but we’ll probably forget anyway. We aim to go to bed at midnight, but most of the time there is still stuff to do. One or both of us doesn’t make it there until one or two. The natural brown Lhasa Wilderness yarn beside one of the blues we cooked that day. And that’s a day in the fabulous life of Lattes & Llamas! Our winters tend to involve less dyeing and more Geek-A-Long madness, but I wouldn’t do anything to change it. It’s been a strange, crazy journey and we’re lucky to have such supportive husbands, who believe in us, even though it means we all had to move in together and they share a den. 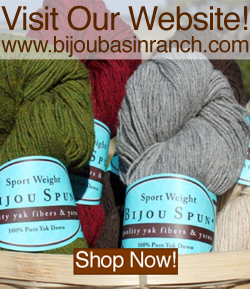 Click here to visit the Lattes & Llamas website & here to see their exclusive hand-dyed colorways available only at bijoubasinranch.com!